Surfer is based on measuring the time it takes for a pulse of longitudinal stress waves (P-waves) to travel from one transducer to another on the same surface. The distance between the transducers is 150 mm. Because point transducers are used, the wave pulse travels away from the transmitting transducer along a spherical wavefront. When the wavefront arrives at the receiving transducer, a signal is generated. 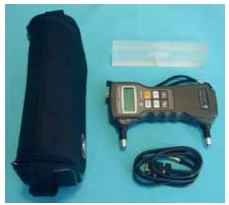 The instrument measures the pulse transit time from transmitter to receiver, and computes the pulse velocity using the known distance between transducers. The transducers are designed to work without a coupling material (grease or gel). 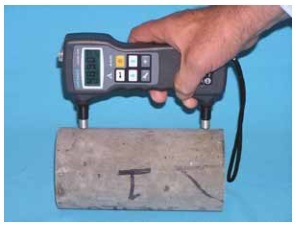 In contrast with traditional pulse velocity instruments, which are based on through transmission, Surfer measures the wave speed in the near-surface concrete. Thus it is not necessary to have access to opposite sides of the test object. 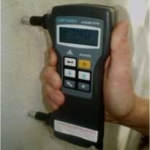 Because there is no cabling, no coupling fluid, and no need to measure the distance between transducers, measurements can be made rapidly within 2 to 3 seconds. 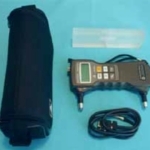 Before making transit time measurements, the menu system and keypad are used to set up the instrument, which includes entering the exact distance between the transducers. 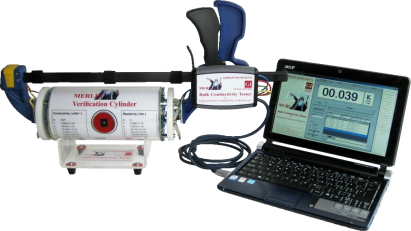 The instrument includes a liquid crystal display (LCD) that can be set up to display transit time or pulse velocity. 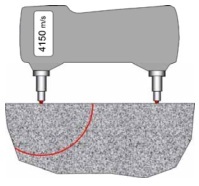 After the set-up parameters have been entered, the transducers are pressed against the concrete surface with a force between 50 to 100 N (10 to 20 lb). 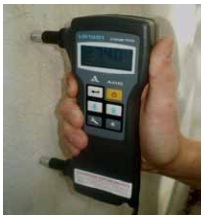 The device will self-activate and begin taking measurements. 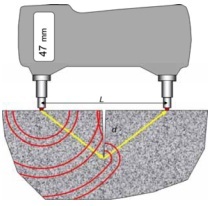 The transducers need to be perpendicular to the surface and a steady pressure needs to be maintained to obtain accurate and consistent measurements. 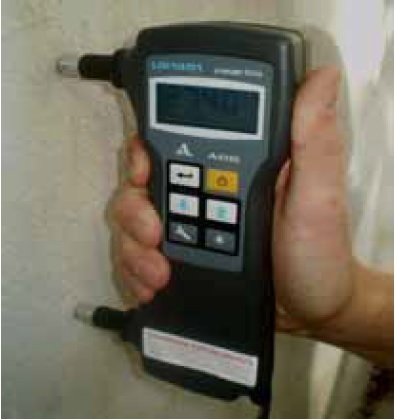 Before making measurements in reinforced concrete, a reinforcement locator should be used locate the reinforcing bars. 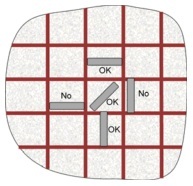 Orient the Surfer so that the effects of the reinforcement are minimized. The above sketch shows acceptable and unacceptable positioning of the Surfer. If the device is aligned close to and parallel to the reinforcement, the stress pulse will refract into the reinforcement and a short transit time will be measured. To use Surfer to estimate early-age strength development of concrete, a relationship needs to be established between concrete strength and pulse velocity. 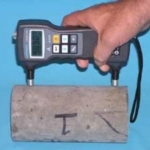 Such a relationship can be established by making pulse velocity measurements on standard strength test specimens and then measuring their compressive strength. The resulting data can be used to develop a regression equation to represent the relationship between concrete strength and pulse velocity. 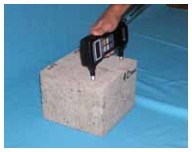 Refer to ACI 228.1R (In-Place Methods to Estimate Concrete Strength) for guidance on developing and using the strength relationship. The relationship that is developed is applicable only to that specific concrete mixture. Where Vi and Ei are the initial values of pulse velocity and modulus of elasticity; and Vn and En are the values of pulse velocity and modulus of elasticity after exposure to the test conditions.